These are prices at my store. The nice thing about Sams is you can always check in-club prices online at their website very easily. Therefore, no need to talk around writing down prices. The prices for Aldi are also based on my store. I did have to walk around the store taking pictures of price tags to compile this list. Even though your store may differ, the general price should be somewhat similar. 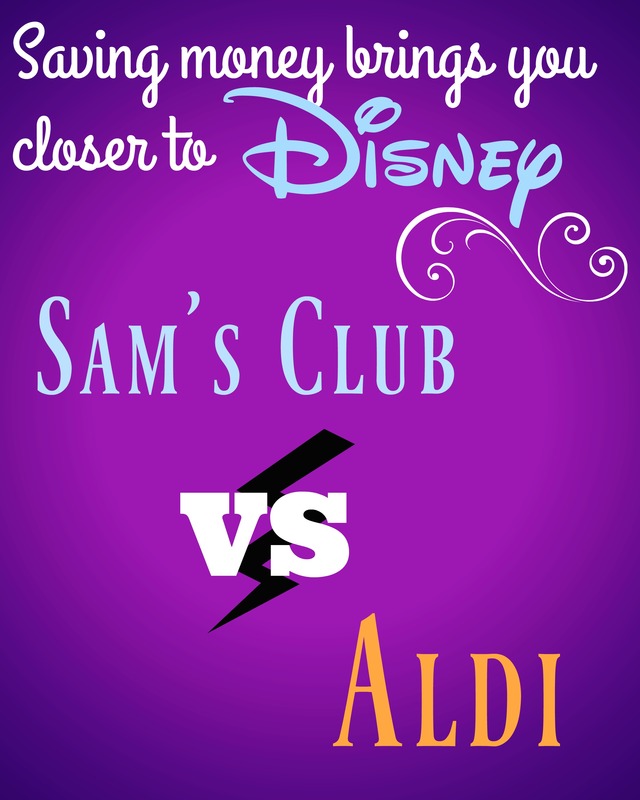 Sams is a warehouse club where you must pay to have a membership, Aldi does not. I find the Sams membership is worth it for us. Sams sells everything in bulk. It is for this reason, I didn’t price produce. We just can’t eat the produce fast enough to keep it from going bad in such large quantities. For this reason, I typically buy all produce at Aldi. I find Sam’s often has more selections of meat and other items. For this reason, I prefer to buy meat there if possible. You will have to store it in the freezer as I doubt your family can eat 6lbs of chicken in one week! I have specified which place is cheaper on this list, but often I will declare one store a winner over another for other reasons – these reasons are in the notes section. I’ve never been to Aldi, I’d like to know more. See my post on Aldi here, complete with price list. As I mentioned above, saving money on groceries gives you more money for vacation. Also, many items at Sam’s are great for bringing with you to Disney (beverages, shelf stable food, etc..). Little known fact, Sam’s sells disney gift cards which can be used anywhere on disney property and these are sold at a discount!